Cutaneous T-cell lymphoma (CTCL) is a malignancy of the T-helper (CD4+) cells of the immune system. CTCL, also known as mycosis fungoides, is a cancer of the white blood cells that primarily affects the skin and only secondarily affects other sites. This disease involves the uncontrollable proliferation of T-lymphocytes known as T-helper cells, so named because of their role in the immune response. T-helper cells are characterized by the presence of a protein receptor on their surface called CD4. Accordingly, T-helper cells are said to be CD4+. The proliferation of T-helper cells results in the penetration, or infiltration, of these abnormal cells into the epidermal layer of the skin. The skin reacts with slightly scaling lesions that itch, although the sites of greatest infiltration do not necessarily correspond to the sites of the lesions. The lesions are most often located on the trunk, but can be present on any part of the body. In the most common course of the disease, the patchy lesions progress to palpable plaques that are deeper red and have more defined edges. As the disease worsens, skin tumors develop that are often mushroom-shaped, hence the name mycosis fungoides. Finally, the cancer progresses to extracutanous involvement, often in the lymph nodes or the viscera. CTCL is a rare disease, with an annual incidence of about 0.29 cases per 100,000 persons in the United States. It is about half as common in Eastern Europe. However, this discrepancy may be attributed to a differing physician awareness of the disease rather than a true difference in occurrence. In the United States, there are about 500-600 new cases a year and about 100-200 deaths. CTCL is usually seen in older adults; the median age at diagnosis is 55-60 years. It strikes twice as many men as women. The average life expectancy at diagnosis is 7-10 years, even without treatment. The cause of CTCL is unknown. Exposure to chemicals or pesticides has been suggested; however, the most recent study on the subject failed to show a connection between exposure and development of the disease. The ability to isolate various viruses from cell lines grown from cells of CTCL patients raises the question of a viral cause, but studies have been unable to confirm these suspicions. The symptoms of CTCL are seen primarily in the skin, with itchy red patches or plaques and, usually over time, mushroom-shaped skin tumors. Any part of the skin can be involved and the extent and distribution of the rash or tumors vary greatly from patient to patient. The only really universal symptom of the disease is the itch and this symptom is usually what brings the patient to the doctor for treatment. If the disease spreads outside of the skin, the symptoms include swelling of the lymph nodes, usually most severe in those draining the areas with skin involvement. Spread to the viscera is most often manifested as disorders of the lungs, upper digestive tract, central nervous system, or liver but virtually any organ can be shown to be involved at autopsy. Some patients with CTCL develop a leukemic phase of the disorder known as Sézary syndrome, which is characterized by the appearance of malignant T cells in the bloodstream. It is named for the French dermatologist who first identified the abnormal T cells. Diagnosis of CTCL is often difficult in the early stages because of its slow progression and ability to mimic many other benign skin conditions. The early patches of CTCL resemble eczema, psoriasis, and contact dermatitis. In a further complication, the early manifestations of the disease can respond favorably to the topical corticosteroid treatments prescribed for these skin disorders. This has the unfortunate result of the disease being missed and the patient remaining untreated for years. CTCL is most likely discovered when a physician maintains a suspicion about the disease, performs multiple skin biopsies, and provides close follow-up after the initial presentation. Skin biopsies showing penetration of abnormal cells into the epidermal tissue are necessary to make a firm diagnosis of CTCL. Several molecular studies can also help support the diagnosis. The first looks at the cellular proteins seen on the surface of the abnormal cells. Many cases of CTCL show the retention of the CD4+ protein, but the loss of other proteins usually seen on the surface of mature CD4+ cells, such as Leu-8 or Leu-9. The abnormal cells also show unusual rearrangements at the genetic level for the gene that encodes the T-cell receptors. These rearrangements can be identified using Southern blot analysis. The information from the molecular tests, combined with the presence of abnormal cells in the epidermis, strongly supports the CTCL diagnosis. Treatment of CTCL depends on the stage of the disease. The current staging of this disease was first presented at the International Consensus Conference on CTCL in 1997. The staging attempts to show the complex interaction between the various outward symptoms of the disease and prognosis. The system has seven clinical stages based on skin involvement (tumor = T), lymph node involvement (LN), and presence of visceral metastases (M). The first stage, IA, is characterized by plaques covering less than 10% of the body (T1) and no visceral involvement (M0). Lymph node condition at this stage can be uninvolved, reactive to the skin disease, or dermatopathic (biopsies showing CTCL involvement) but not enlarged (LN0-2). The shorthand expression of this stage is therefore T1, LN0-2, M0. The next stage, IB, differs from IA in that greater than 10% of the body is covered by plaques (T2, LN0-2, M0). Stage IIA occurs with any amount of plaques in addition to the ability to palpate the lymph node and the lymph uninvolved, reactive, or dermatopathic (T1-2, LN0-2, M0). Treatments applied to the skin are preferred for patients having these preliminary stages of the disease, commonly topical chemotherapy with mechlorethamine hydrochloride (nitrogen mustard) or phototherapy of psoralen plus ultraviolet A (PUVA). Topical chemotherapy involves application to the skin of nitrogen mustard, an alkylating agent, in a concentration of 10-20 mg/dL in an aqueous or ointment base. Treatment of affected skin is suggested at a minimum and application over the entire skin surface is often recommended. Care needs to be taken that coverage of involved skin is adequate, as patients who self-apply the drug often cannot reach all affected areas. The most common side effect is skin hypersensitivity to the drug. Nearly all patients respond favorably to this treatment, with a 32-61% complete response rate, based on amount of skin involvement. Unfortunately, only 10-15% of patients maintain a complete response rate after discontinuing the treatment. Phototherapy involves treatment with an orally administered drug, 8-methyloxypsoralen, that renders the skin sensitive to long-wave ultraviolet light (UVA), followed by controlled exposure to the radiation. During the initial treatment period, which may last as long as six months, patients are treated two to three times weekly. This is reduced to about once monthly after initial clearing of the lesions. Redness of the skin and blistering are the most common side effects of the treatment and are much more common in patients presenting with overall skin redness, or erythroderma, so lower intensities of light are usually used in this case. About 50% of all patients experience complete clearance with this treatment. Some patients with very fair skin and limited skin involvement can successfully treat themselves at home with special lamps and no psoralen. The next stage, IIB, involves one or more cutaneous tumors, in combination with absent or present palpable lymph nodes, lymph uninvolved, reactive, or dermatopathic, and no visceral involvement (T3, LN0-2, M0). Stage III is characterized by erythroderma, an abnormal redness over widespread areas of the skin (T4, LN0-2, M0). For more extensive disease, radiation therapy is an effective treatment option. It is generally used after the topical treatments have proven ineffective. Individual plaques or tumors can be treated using electrons, orthovoltage x rays, or megavoltage photons with exposure in the range of 15 to 25 Gy. Photon therapy has proven particularly useful once the lymph nodes are involved. Another possibility is total-skin electron beam therapy (TSEB), although the availability of this treatment method is limited. It involves irradiation of the entire body with energized electrons. Side effects of this treatment include loss of finger and toe nails, acute redness of the skin, and inability to sweat for about six to 12 months after therapy. Almost all patients respond favorably to radiation treatment and any reoccurrence is usually much less severe. Combination of different types of treatments is a very common approach to the management of CTCL. Topical nitrogen mustard or PUVA is often used after completion of radiation treatment to prolong the effects. The addition of genetically engineered interferon to PUVA therapy significantly increases the percentage of patients showing a complete response. Furthermore, although treatments using chemotherapy drugs alone, such as deoxycofomycin or etretinate, have been disappointing for CTCL, combining these drugs with interferon has shown promising results. Interferon has also been combined with retinoid treatments, although the mechanism of action of retinoids (Vitamin A analogues) against CTCL is unknown. The final two stages of the disease are IVA and IVB. IVA presents as any amount of skin involvement, absent or present palpable lymph nodes, no visceral involvement, and lymph that contains large clusters of convoluted cells or obliterated nodes (T1-4, LN3-4). IVB differs in the addition of palpable lymph nodes and visceral involvement (T1-4, LN3-4, M1). All of the treatment methods described above are appropriate for the final two stages of the disease. A newer drug that has been used to treat CTCL is bexarotene, a topical gel that is a synthetic retinoid analog. Bexarotene has been shown to be effective in clinical trials for stage IA or IB CTCL, and has fewer side effects than topical nitrogen mustard or electron beam radiotherapy. Another team of researchers at the University of Pennsylvania reported in 2003 that bexarotene combined with psoralen and UVA therapy is also effective in treating patients with advanced CTCL. A treatment for advanced CTCL that is considered experimental as of mid-2003 is alemtuzumab, a monoclonal antibody. A Swedish study of 22 patients with advanced CTCL and Sézary syndrome found that alemtuzumab relieved symptoms in 55% of patients, with 32% in complete remission and 23% in partial remission. Itching of the skin is one of the most troublesome symptoms of CTCL. One alternative treatment for itchiness is the application of a brewed solution of chickweed that is applied to the skin using cloth compresses. Another suggested topical application is a mixture of vitamin E, vitamin A, unflavored yogurt, honey, and zinc oxide. Evening primrose oil applied topically is also claimed to reduce itch and promote healing. Alkylating agent — A chemical that alters the composition of the genetic material of rapidly dividing cells, such as cancer cells, causing selective cell death; used as a topical chemotherapeutic agent to treat CTCL. Cutaneous — Pertaining to the skin. Erythroderma — An abnormal reddening of the entire skin surface. Monoclonal antibody — An antibody produced by the identical offspring of a single cloned antibody-producing cell. Mycosis fungoides — Another name for cutaneous T-cell lymphoma. Sézary syndrome — A leukemic phase of CTCL that develops in some patients, characterized by the appearance of malignant T cells in the peripheral blood and sometimes in the lymph nodes. The syndrome is named for Alfred Sézary (1880–1956), a French dermatologist. T-helper cells — A cellular component of the immune system that plays a major role in ridding the body of bacteria and viruses, characterized by the presence of the CD4 protein on its surface; the type of cell that divides uncontrollable with CTCL. Total-skin electron beam therapy — A method of radiation therapy used to treat CTCL that involves bombarding the entire body surface with high-energy electrons. The prognosis for CTCL is dependent on the stage of the disease. Prognosis is very good if the disease has only progressed to Stage IA, with a mean survival of 20 or more years. At this point, the disease is a very low mortality risk to the patient, with most deaths occurring to persons in this group unrelated to CTCL. For patients diagnosed at stages IB and IIA, the median survival is about 12 years. The disease in both of these stages involves intermediate risk to the patient. Patients in stage III and IVA have a mean life expectancy of about five years. At these later stages, the disease is high risk, with most deaths occurring by infection due to the depleted immune system of the later-stage patient. Once a patient has reached stage IVB, the mean life expectancy is one year. Studies have been unable to link CTCL to any environmental or genetic factors as of 2003, so prevention at this time is not possible. Beers, Mark H., MD, and Robert Berkow, MD, editors. "Lymphomas: Mycosis Fungoides." Section 11, Chapter 139 In The Merck Manual of Diagnosis and Therapy. Whitehouse Station, NJ: Merck Research Laboratories, 2004. Hoppe, Richard T. "Mycosis Fungoides and Other Cutanous Lymphomas." In The Lymphomas, edited by George P. Canellos, et al. Philadelphia: W.B. Saunders Co., 1999. Wilson, Lynn D., et al. "Cutaneous T-Cell Lymphomas." In Cancer Principles & Practice of Oncology, edited by Vincent T. DeVita, et al. Philadelphia: Lippincott Williams & Wilkins, 2001. Dawe, R. S. "Ultraviolet A1 Phototherapy." British Journal of Dermatology 148 (April 2003): 626-637. Elmer, Kathleen B., and Rita M. George. "Cutaneous T-Cell Lymphoma Presenting as Benign Dermatoses." American Family Physician 59 (May 1999): 2809-2815. Kari, L., A. Loboda, M. Nebozhyn, et al. "Classification and Prediction of Survival in Patients with the Leukemic Phase of Cutaneous T Cell Lymphoma." Journal of Experimental Medicine 197 (June 2, 2003): 1477-1488. Lundin, J., H. Hagberg, R. Repp, et al. "Phase 2 Study of Alemtuzumab (Anti-CD52 Monoclonal Antibody) in Patients with Advanced Mycosis Fungoides/Sézary Syndrome." Blood 101 (June 1, 2003): 4267-4272. Martin, A. G. "Bexarotene Gel: A New Skin-Directed Treatment Option for Cutaneous T-Cell Lymphomas." Journal of Drugs in Dermatology 2 (April 2003): 155-167. McGinnis, K. S., M. Shapiro, C. C. Vittorio, et al. "Psoralen plus Long-Wave UV-A (PUVA) and Bexarotene Therapy: An Effective and Synergistic Combined Adjunct to Therapy for Patients with Advanced Cutaneous T-Cell Lymphoma." Archives of Dermatology 139 (June 2003): 771-775. American Cancer Society. 1599 Clifton Road NE, Atlanta, GA 30329. (800) ACS-2345. National Cancer Institute (NCI). NCI Public Inquiries Office, Suite 3036A, 6116 Executive Boulevard, MSC8332, Bethesda, MD 20892-8322. (800) 4-CANCER or (800) 332-8615 (TTY). http://www.nci.nih.gov. a chronic progressive lymphoma arising in the skin that initially simulates eczema or other inflammatory dermatoses; the appearance of plaques is associated with acanthosis and bandlike infiltration of the upper dermis by a pleomorphic infiltrate including helper T lymphocytes with large, convoluted nuclei that also collect in clear spaces in the lower epidermis (Pautrier microabscesses); in advanced cases, ulcerated tumors and infiltration of lymph nodes may occur. 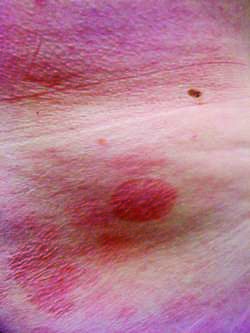 A chronic progressive lymphoma arising in the skin that initially simulates eczema or other inflammatory dermatoses; in advanced cases, ulcerated tumors and infiltrations of lymph nodes may occur. A malignant non-Hodgkin lymphoma with a predilection for infiltrating the skin. In its earliest stages, it often is mistaken for a mild, chronic dermatitis because it appears as itchy macules and patches, often on the chest or trunk. Later, the lesions may thicken, become nodular, or spread throughout the entire surface of the skin, the internal organs, or the bloodstream. Jean Louis Marc, French dermatologist, 1768-1837. Primary cutaneous T-Cell lymphomas showing gamma-delta ([gamma][delta]) phenotype and predominantly epidermotropic pattern are clinicopathologically distinct from classic primary cutaneous [gamma][delta] T-Cell lymphomas. The study's design made it possible to pinpoint dates of diagnosis more effectively than investigators could estimate disease duration or confirm whether patients initially diagnosed with psoriasis actually had cutaneous T-cell lymphoma, Dr.
Identify and understand important and diverse types of therapeutics under development for Cutaneous T-Cell Lymphoma. Cutaneous T-cell lymphoma is a cancer of the T-lymphocytes in the skin. Bexarotene (Targretin) is the first topical therapy approved for patients with cutaneous T-cell lymphoma (CTCL), according to the manufacturer, Ligand Pharmaceuticals in San Diego. Gasparro of the Yale University School of Medicine is seeking cell-surface targets for psoralen -- a treatment for psoriasis and cutaneous T-cell lymphoma -- to help explain the drug's apparent ability to stimulate an immune response against abnormally dividing skin cells. US-based miRagen Therapeutics has reported new interim results from its ongoing phase 1 clinical trial assessing the safety, efficacy and pharmacokinetics of MRG-106 in patients with the mycosis fungoides form of cutaneous T-cell lymphoma, it was reportedon Monday. It is directed to CD30, which is expressed on skin lesions in about 50% of patients with cutaneous T-cell lymphoma. Mycosis fungoides is the most common cutaneous T-cell lymphoma. is formulating a topical gel to treat cutaneous T-cell lymphoma, a type of cancer. marketing approval for the treatment of early stage (stages I-IIA) mycosis fungoides, the most common type of Cutaneous T-Cell Lymphoma (CTCL).